You are here: Home / Ali'i / Chiefs / Governance / Did The Early Hawaiians Have Iron? Did The Early Hawaiians Have Iron? Hawaiian stone tools came in a variety of shapes and sizes, and likewise served a variety of needs. They were traditionally used to scrape, chop, carve, chisel, gouge, perforate and strip. Stone tools also assisted in fishing; stone components were used in lures to catch many types of fish and squid. In addition to use in making weapons, stone tools were shaped into clubs, axes, sling stones and other lethal weapons. We are generally aware of the extensive use and nature of stone tools that the Hawaiians had and used. But, did they also have and use iron tools – if so, how did they get them? It turns out iron knives were found in the hands of Hawaiians on Kauaʻi on Captain Cook’s first visit in 1778. Iron, crafted into various shapes, was observed on other islands, as well. It is interesting to note that a Spanish word for iron ore is “Hematitas”. … Hmmm. Journals and other accounts by Cook and his officers aboard the Discovery and Resolution, note they observed five pieces of iron. Of these, the two iron skewers or daggers seen at Maui are believed to have been ship spike nails that they reshaped. A third piece was a dagger made from a ship’s bolt which was floated in wreckage to Kauaʻi about October, 1778. Cook’s vessels were at Kauai only a few days in January 1778. When they returned thirteen months later, Samwell and Edgar observed that the Hawaiians had made a dagger from an iron bolt which had been drifted ashore with wreckage five months before. Crew journals also note two knives, which have subsequently been identified as Japanese. One was a fish knife, always carried on Japanese sampans; the other was a fish and vegetable knife, generally carried on sampans. On the second visit of the ships (1779), Ms. W Bayly ascertained that all the iron seen in the hands of the Kauaʻi natives had floated ashore in wreckage, a statement which Edgar also made on his second visit after a close enquiry of one of the chiefs. It turns out that among practically all the Polynesians, as recorded by the European voyagers, iron was immediately recognized and was by far the most desired commodity which the foreigners could supply. This apparent widespread knowledge of iron might imply a common and ancient Polynesian acquaintance with the metal. A fair conclusion would be that the Hawaiians (and probably all other Polynesians) were not iron smelters, and their acquaintance with iron was limited to the finished material made by other people. 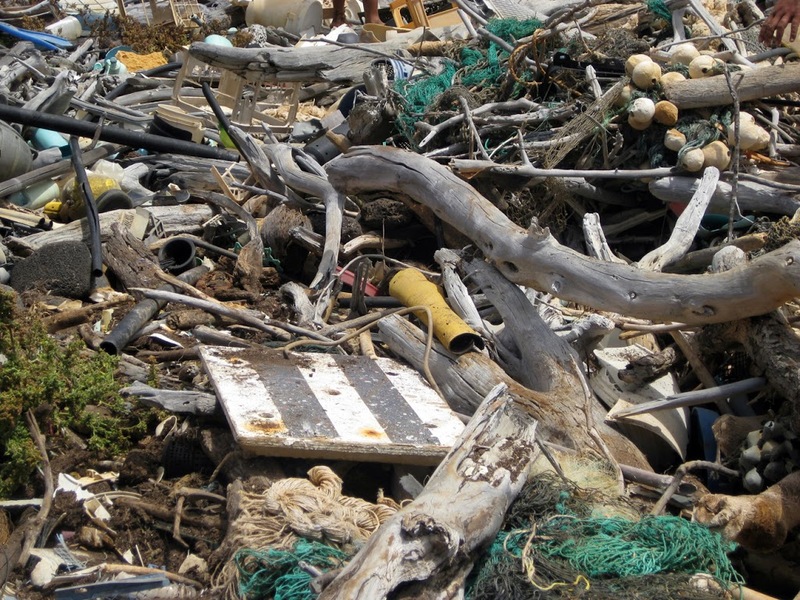 The image shows some of the modern marine debris in Hawaiʻi. Note the formed wood that could easily have nails and other metals with it. Likewise, note the incessant flow of plastics, fishing gear and other marine debris onto our Islands’ shores. In addition, I have added other related images in a folder of like name in the Photos section on my Facebook and Google+ pages. Thanks Peter! This is really fascinating. It makes total sense that early Hawaiians made good use of these “gifts” of iron.